The idea of ‘Symbiosis’ is nurtured by Dr. S. B. Mujumdar on the principles of vedic thought ‘Vasudhaiva Kutumbakam’ which means ‘World as One Family’. 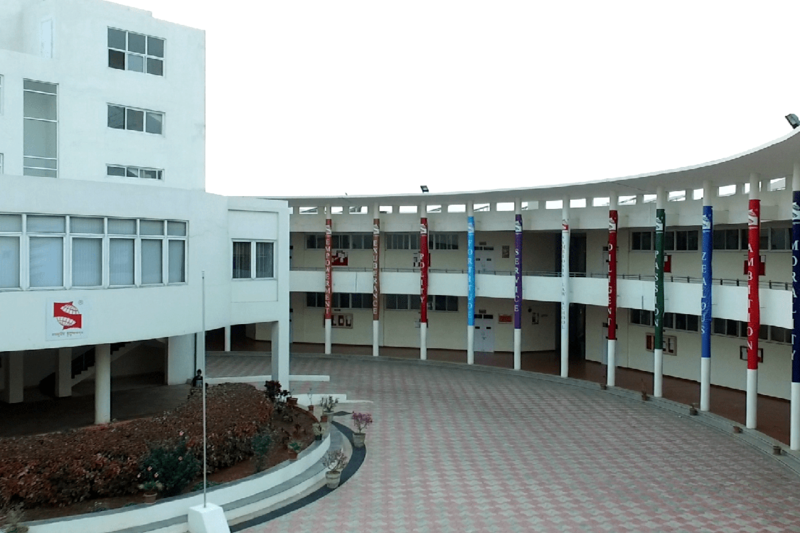 Symbiosis Law School (SLS) Hyderabad is established in 2014 inheriting splendid novelty, dynamism and excellence in education of Symbiosis International University, Pune. The Legacy of Symbiosis Law Schools in excellence and quality began with Symbiosis Law School Pune, which is consistently ranked among top 10 law schools in India in last 13 years. As a policy, the Symbiosis Law School, Pune will mentor the Symbiosis Law School Hyderabad campus. Symbiosis Law School Hyderabad is founded on pillars of expertise, justice and Service and is committed to impart quality legal education confirming to acclaimed International standards. SLS, Hyderabad is cocooned in the upcoming educational zone with state of art infrastructure catering impending needs of student community. It is located in the Mamidipalli village Mahabubnagar district, of Telangana near Hyderabad; just 45 minutes away from the International airport and is neighbor to the Tata Institute of Social Sciences [TISS]. It share expertise in imparting quality legal education through competent and well qualified teaching staff, techno-driven research culture, Internationalization, centers of excellence, training and skill enhancement programmes, moot courts and the like. It is committed to contribute to the justice mission of the state by initiating pro-bono activities to help poor and marginalized people though community lawyering, legal aid camps and permanent legal aid clinics. Further, it endeavors to create value conscious skilled lawyers with par excellence serving dynamic needs of the community through Bar and Bench. SLS, Hyderabad offers five-year integrated undergraduate programmes like Bachelor of Arts and Bachelor of Laws (BA LL.B) and Bachelor of Business Administration and Bachelor of Laws (BBA LL. B) to cater to varied needs of the profession. The curricular enrichment is ensured with the involvement of judges, eminent lawyers, International jurists, industry experts etc and best practices are reflected in teaching-learning pedagogy. SLS, Hyderabad believes in holistic development of nascent legal minds and ensures learning beyond classroom by planning field visits and workshops in collaboration with various stake holder and NGOs. It provides conducive and competitive learning environment by encouraging students to take part in national and International competitions. Symbiosis Law School Hyderabad is committed to hone professional skills of students to be recruited in preeminent law firms, corporate houses, Judiciary, Civil Services, banks, insurance companies, NGO’s and the like. It will seek internship & placement opportunities for students through the strong and well connected alumina network of SLS Pune. The value of Symbiosis Law School lies in its legacy, quality and excellence with well-defined personal care and progress strategy. SLS, Hyderabad is cocooned in the upcoming educational zone with state of art infrastructure catering impending needs of student community.